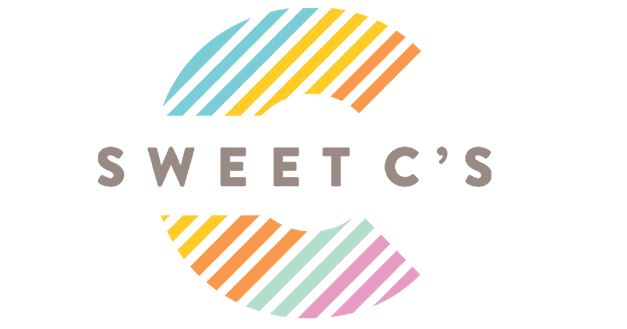 This post is sponsored by Princess Cruises, and contains affiliate links. 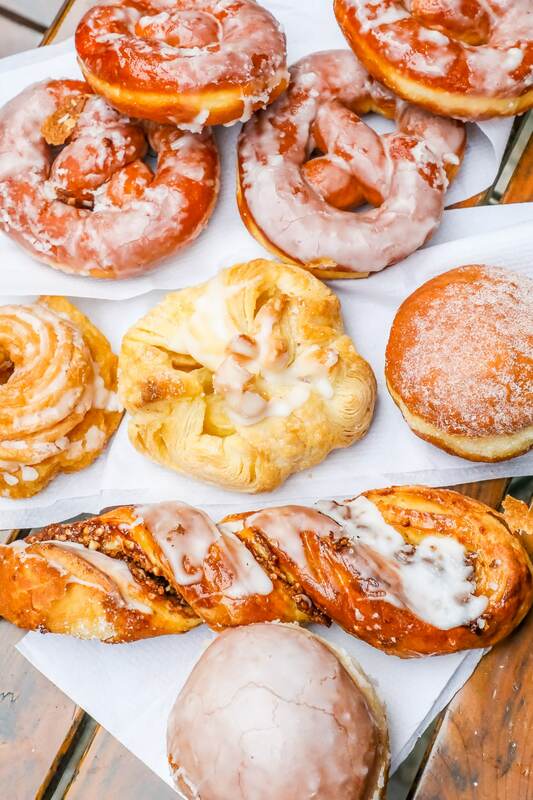 I love to share brands that I use regularly in my life that I know readers will love – and Princess is the best for luxurious cruises to fantastic destinations, with GREAT food! When we got off the ship in Warrenmunde, we immediately boarded a train – Princess charters private trains to make the 2 hour trek south from the idyllic harbour town to bustling Berlin. Along the rise, we watched rolling hills spotted with farms that showed off a bright yellow hue from blooming rapeseed flowers. It was a long ride, but very comfortable and serene – my cousin and I used the time to catch up on some extra winks of sleep, and rest up for a short but busy couple hours in Berlin! 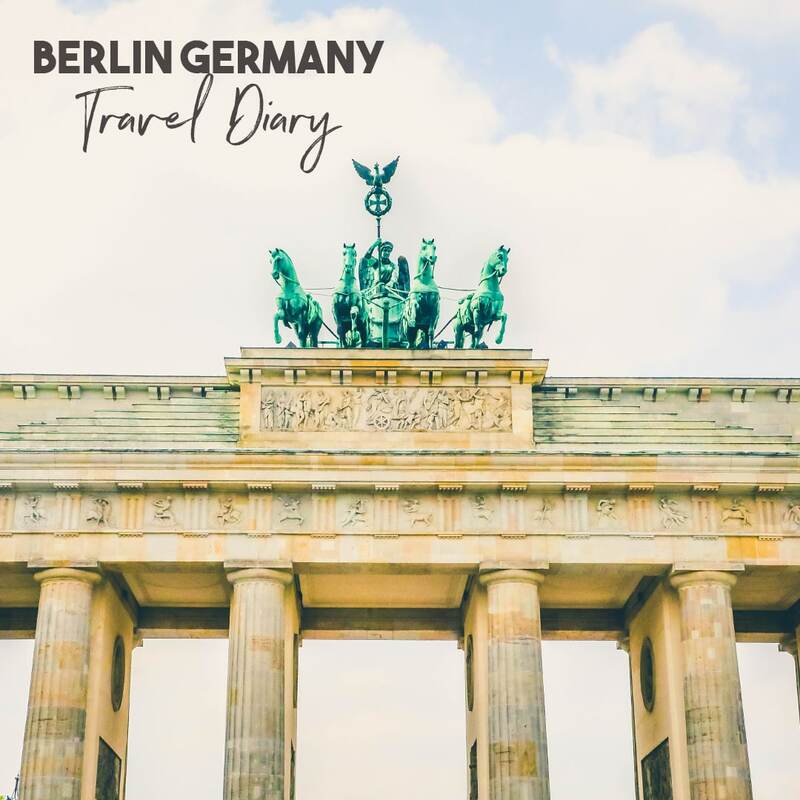 While the trip was not nearly enough time to take in all Berlin had to offer, it was a great way to get a feel of the city, and entice us to all come back soon – I am especially excited since my brother and sister in law live outside of Frankfurt, and go to Berlin often! I see a trip with them in my future, soon! 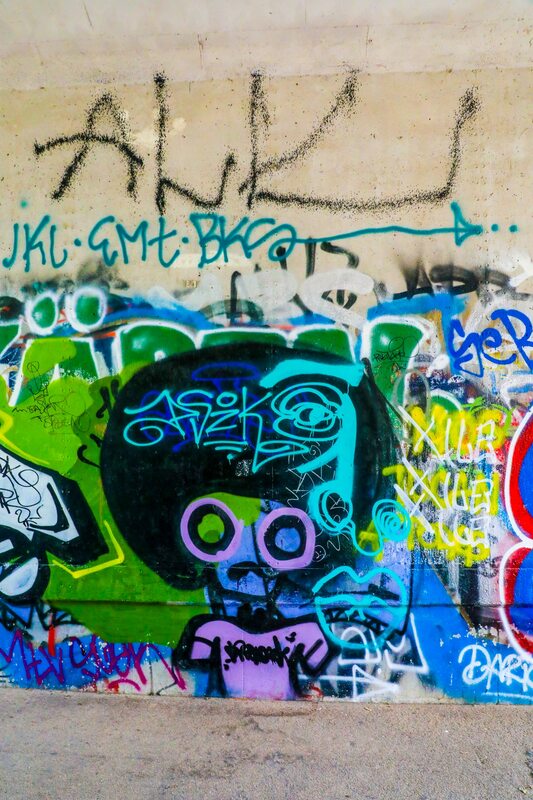 While in the US, a lot of us might bristle at graffiti and street art, it was a very significant role in Berlin. During Nazi and Red Army occupation, self expression (and a lot of the arts, of any kind, but especially anything counter-culture) was expressly forbidden. The west side of the Berlin wall was famously covered in graffiti as a sign of protest (of course, the Soviet-held Eastern side was pristinely clean, enforced by armed guards in towers who shot those trying to deface, climb over, or even go near the wall) – and graffiti is an important reminder of resistance to the Soviet occupation, not only in Germany, but in many former Soviet states. 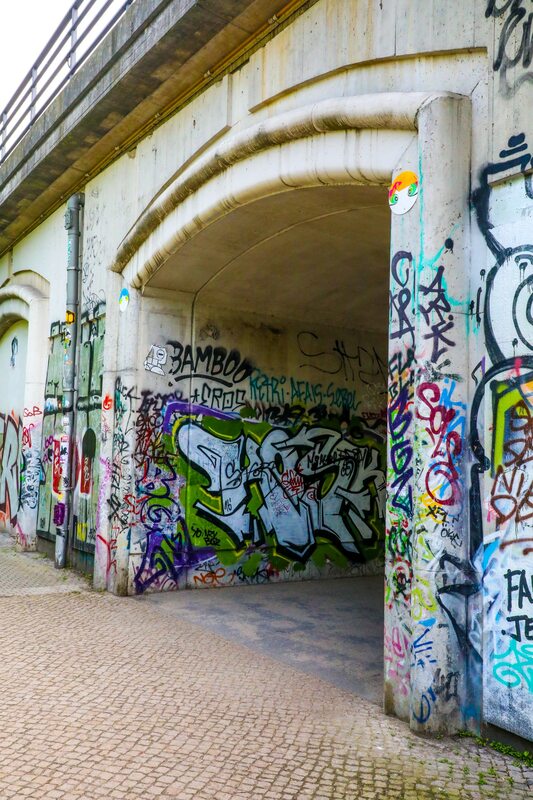 Berlin is full of interesting art, all over the city! Just walking the streets you will find interesting pieces, some to mark former buildings that were flattened by the Nazis or in WWII, some to depict Germany’s role as a leader of the EU, some just as an expression. 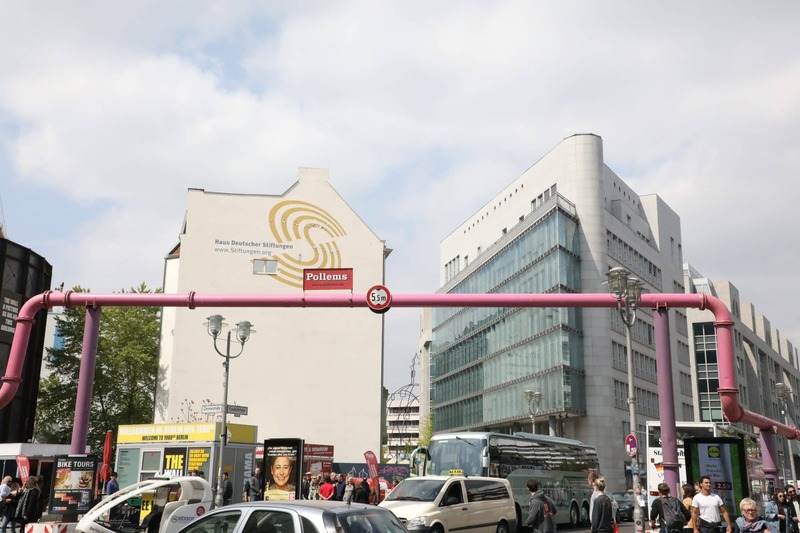 All over Berlin, there are bright and vibrant pink pipes. At first I didn’t know what they were – was is an outline of the former Berlin Wall? Was it art? Were they carrying heat like the pipes alongside the train that we saw? 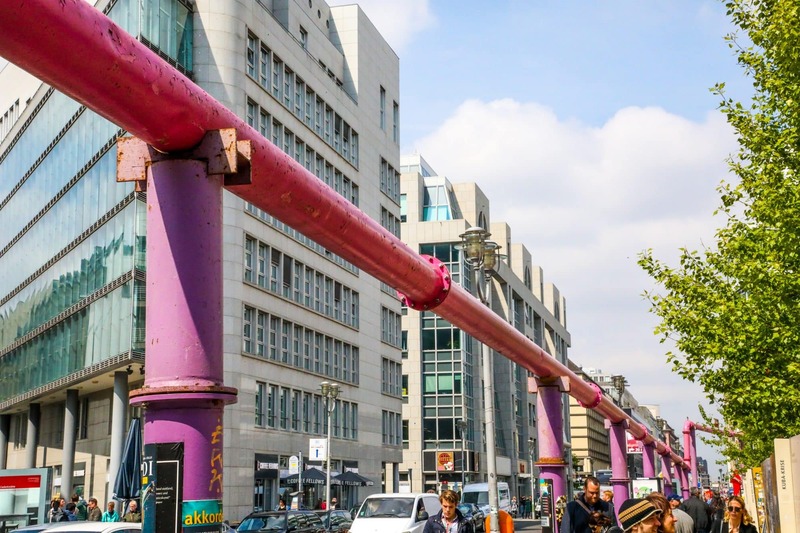 It turns out, the pink pipes that run all over Berlin are actually carrying swamp water. Berlin was once a swamp – and floods easily. To keep it safe and dry, the pipes are constantly pumping water! We sadly could not go see the Reichstag Building (where the German government meets), because you generally need to get tickets far in advance – which would work for most people cruising. We simply forgot to book the tickets – so if you want to see the building (my brother in law lives in Germany and said it is a MUST), be sure to register early. 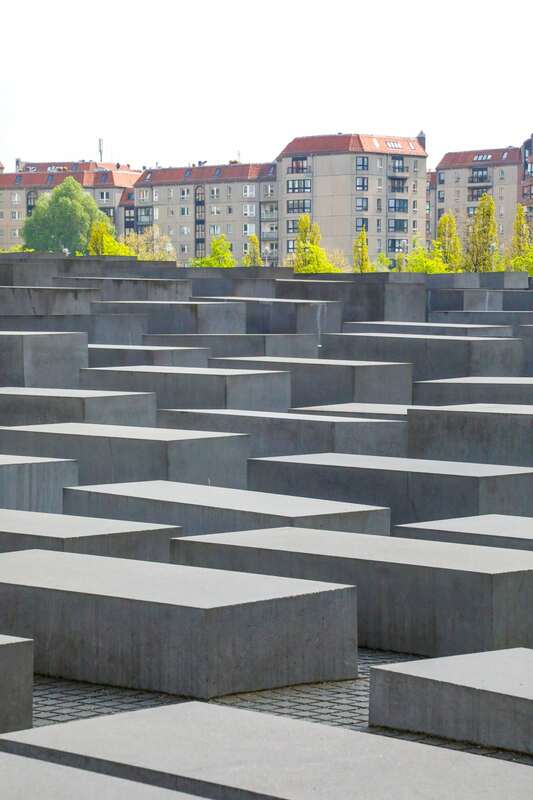 The Monument to the Murdered Jews of Europe is a sprawling maze of concrete boxes that are meant to symbolize the millions of Jews murdered in the Holocaust. From the sides, the monument looks quite small – like stacked boxes a couple of feet high. As you move towards the center, however, the boxes rise up and the pathway sinks down – and it starts to tower above you. It is extremely distressing and disorienting inside the monument, and is really easy to become completely lost. Our group actually all got separated at one point and couldn’t find each other – which was a reminder of so many families that were torn apart. The memorial is a somber, quiet place to reflect, and very worthy of a visit. We did not get to visit the museum as we tried to fit as many things into our Berlin tour as possible, but if you have more time it is a must. I will note however that it was very upsetting to see the large amount of people jumping on the memorial, taking selfies on the blocks, and playing in the space – which is a tribute to lives lost in the Holocaust. If you go, please keep the reverence of the monument, and don’t be afraid to shoo people off the blocks if they are being inappropriate. While there are guards who watch over some of the area, it is such a big space they can’t do it all. 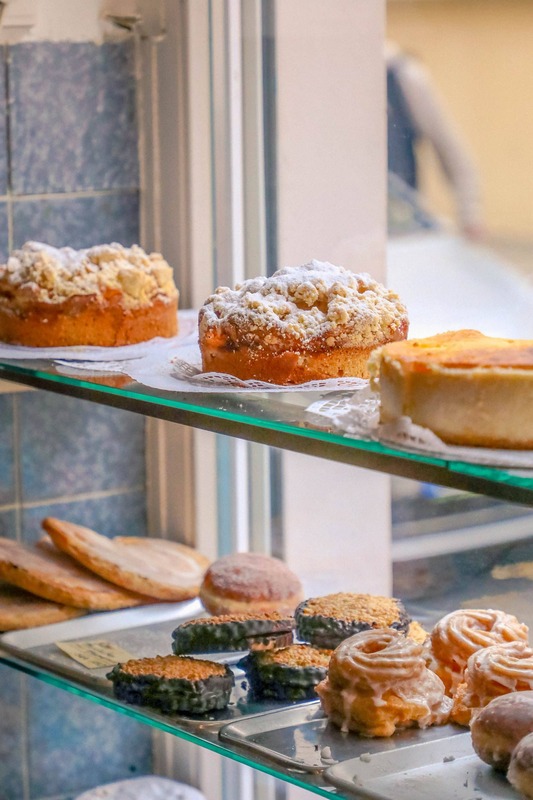 The things we were most excited for in Berlin were all baked – and let me tell you, we did not miss out on some of the best Berlin had to offer! 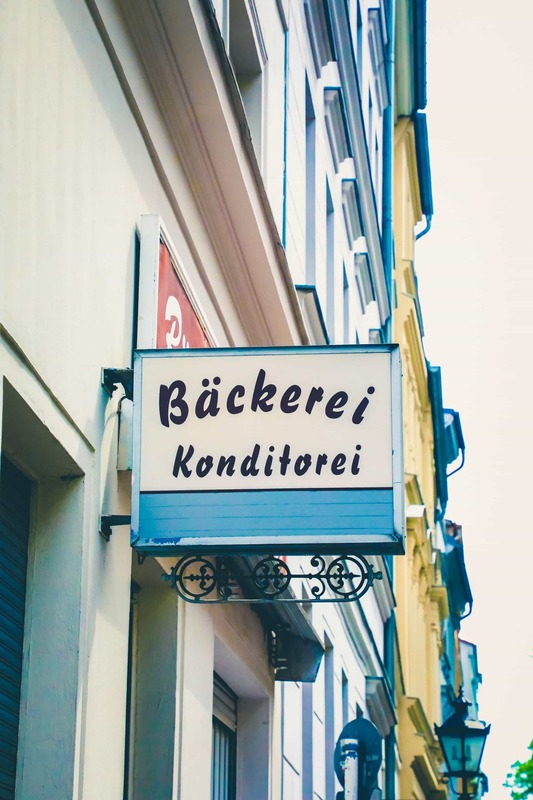 Our first stop was straight to one of Berlin’s oldest bakeries, Bäckerei & Konditorei W. Balzer, did NOT dissappoint. 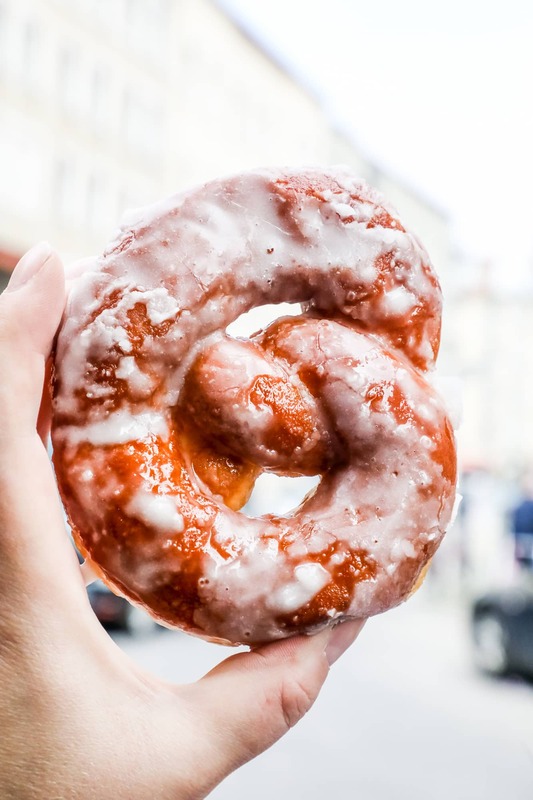 A short taxi ride to Mitte (we did walk back from the bakery to the holocaust memorial – it isn’t very far, but we wanted to maximize time), brought us to the most heavenly doughnuts, including a pretzel doughnut and a crueler that was nothing short of heaven sent. It is a MUST when visiting! Next up, we were dying for some traditional German favorites – and hit up a tiny restaurant for sausages, pretzels, cheese, beer, and meat! To get to Berlin from the town the Regal Princess docks in, you must take a train ride. The ride was a little closer to 3 hours than the advertised 2 on the way down (thanks to a delay on the tracks, which is in no way something the excursion operator can control), but felt much speedier on the way back. The train was air conditioned, comfortable, and the shore excursion staff provided water and light refreshments. There was also a cart selling wine and snacks on our return. 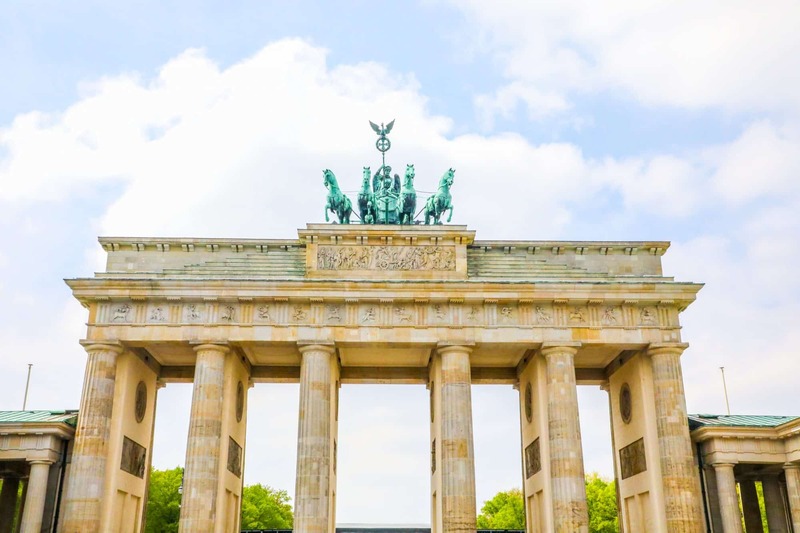 When you get to Berlin, you board a motorcoach for a very short ride that will take you to Berlin’s city center – where the rest of the city is a breeze to explore. You will be a short walk from most monuments – or you could ride the double-decker tour bus around to see everything major as well. Our excursion tour guide dropped us off in the city center and invited anyone to come and tour with him and he would help people maximize their “tour on your own” time – but as we had set plans to visit some bakeries, we went a bit off script – but if you’re dying to see as many monuments as you can in a short period of time, that would be the way to go!